Boca Raton, FL – Debbie Abrams, president of the Gold Coast PR Council(GCPRC), South Florida’s largest independent association of public relations, communications and marketing professionals, today announced the list of this year’s Bernays Awards nominees. GCPRC have given out these awards since 2005 honoring excellence in local public relations campaigns, marketing programs, and media coverage. 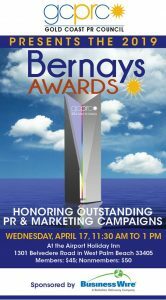 The honors will be presented at the 14th annual Bernays Awards Luncheon on Wednesday, April 17, at the Airport Holiday Inn, 1301 Belvedere Road in West Palm Beach. GCPRC will present Bernays Awards in 15 categories, 12 of them competitive and three selected by the nonprofit organization’s board of directors. Only one award is ever announced in advance, GCPRC’s prestigious Presidents Award, which is given to a person or organization for truly outstanding performance. This year’s Presidents Award goes to the South Florida Sun-Sentinel for its brilliant and sensitive coverage of the Parkland school shooting and the ongoing aftermath. Previous winners of this award include Elizabeth Kelley Grace and Julie Mullen of The Buzz Agency/2017; cultural reporters Rod Hagwood (Sun-Sentinel), Jan Sjostrom (Palm Beach Daily News), andLeslie Streeter(Palm Beach Post)/2016; publishersJohn & Margaret Mary Shuff(Boca Magazine)/2015; Florida Weekly and The Coastal Star/2014, etc. In addition, two other Board selected awards will be announced at the Luncheon: PR Star, which goes to a person or organization that made an extraordinary splash last year, and the Founders Award, which goes to a person or organization that has made a lasting contribution to GCPRC. Tickets to GCPRC’s Bernays Award Luncheon are $45 for members and $50 for nonmembers. They are available for purchase online at www.goldcoastprcouncil.com. For more information about the Gold Coast PR Council and its monthly lunch meetings and special events, please visit www.goldcoastpr.council.com. Next Post Claim your dates for the 2019-2020 season!